Named one of the Funniest Sites on the Web by PC World and winner of the 2011 Bloggies Awards for Most Humorous Weblog and Best Writing, the creator of the immensely popular “Hyperbole and a Half” blog presents an illustrated collection of her hilarious stories with fifty percent new content. 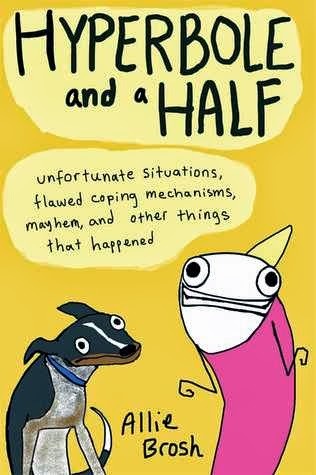 In a four-color, illustrated collection of stories and essays, Allie Brosh’s debut Hyperbole and a Half chronicles the many “learning experiences” Brosh has endured as a result of her own character flaws, and the horrible experiences that other people have had to endure because she was such a terrible child. Possibly the worst child. For example, one time she ate an entire cake just to spite her mother. Brosh’s website receives millions of unique visitors a month and hundreds of thousands of visitors a day. This amalgamation of new material and reader favorites from Brosh's blog includes stories about her rambunctious childhood; the highs and mostly lows of owning a smart, neurotic dog and a mentally challenged one; and moving, honest, and darkly comic essays tackling her struggles with depression and anxiety, among other anecdotes from Brosh's life. Artful, poignant, and uproarious, Brosh’s self-reflections have already captured the hearts of countless readers and her book is one that fans and newcomers alike will treasure. This was a highly entertaining book that didn't take me very long to get through. I love Brosh's blog Hyperbole and a Half and it was like reading her blog in printed form... The pictures from both her book and blog are probably the best part, by the way. I found her writing about her experience with depression to be touching and explained in a way that it makes it easier for people who have never dealt with it to understand. OK, I'll be honest. You could skip buying the book and read the blog for some of the chapters in the book, but the book is highly entertaining and when you want to read it you don't need internet access. Also, it's very colorful and doesn't require batteries to read it... unless you're reading it at in the dark by flashlight. And if you really prefer a digital version it's available on Kindle and other electronical versions. But if you like her blog you'll like this book.